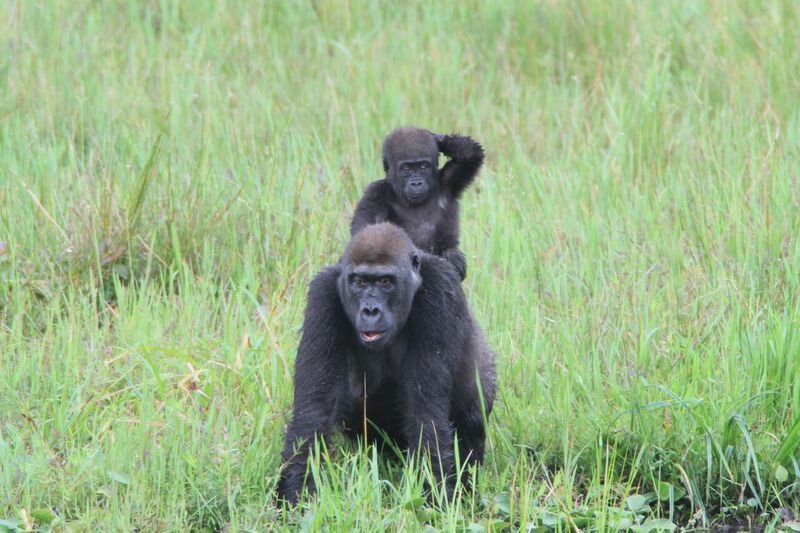 At Mbeli, we follow twenty-one groups of gorillas that come to feed in the clearing. The number of individuals in a group ranges from just two to around 13. In gorillas, it is generally only the mother that takes care of her infant, with no assistance from the other members of the group. On rare occasions however, we have observed juveniles carrying their siblings on their back or helping them when they are climbing trees. These altruistic behaviors have been observed in only two of the groups followed at Mbeli, and in both female and male juveniles. While rare in the wild, this phenomenon seems quite common in habituated or captive groups of gorillas. Zulu’s group is one of these groups where juveniles have been observed caring for and supervising their siblings without interruption from the mother. There are a total of eight individuals in the group, including the silverback, Zulu. 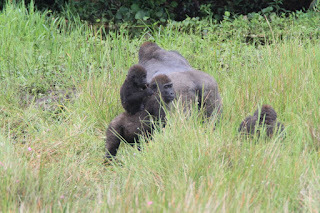 The rest of the group is composed of Bofi, a young silverback; Dinka, the only adult female left in the group; two of her offspring: Hutu, a female juvenile and Duma, an infant male. There are also three other juveniles in the group, two males: Teke and Kikuyu, and a female, Baluba. All the juveniles in this group assist in the care of Duma, who is still dependent on his mother. To date, we have never seen Duma’s mother Dinka interfere or prevent the siblings from interacting with Duma. 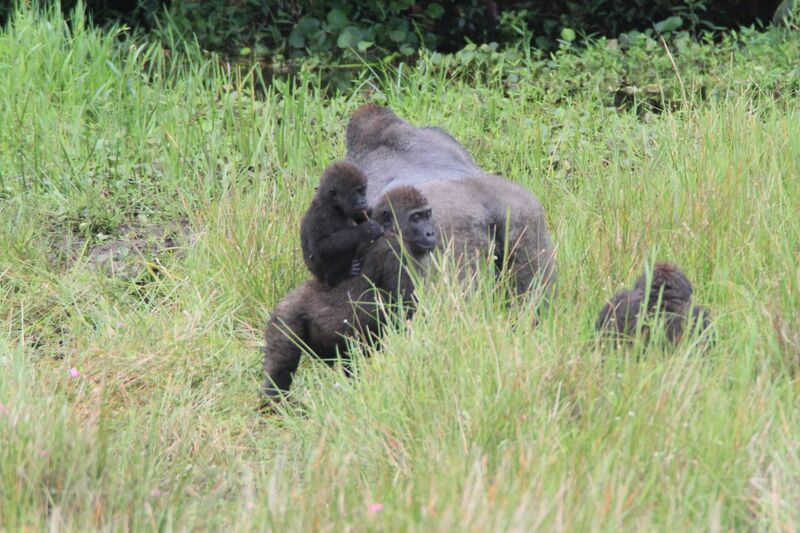 Kikuyu carrying his half-brother Duma on his back. Photo by Vidrige Kandza. Although the behavior of carrying young siblings around is quite rare in the Mbeli population, it is quite common in Zulu’s group. We have even observed the juvenile Baluba following infant Duma into a tree and extending her hand to help him climb safely. She then continues to monitor Duma’s travel up the tree. So far it is unclear why these behaviors occur only in some of the groups observed. In certain groups, sibling intervention is not even tolerated by the mothers who are very possessive over their offspring. Over time, we hope to record more of these behaviors and evaluate the influence of specific factors such as the age of the mother, the time the group spends together, and the presence of their own juveniles in the group on the tolerance of the mother toward the help of those juveniles. It would also be very interesting to know whether these early parenting opportunities have an influence on the future reproductive success of these individuals. The Mbeli Bai GorillaStudy is one of Woodland Park Zoo’s Partners for Wildlife programs. Established in 1995, the goal of the project is to continue providing information on the population dynamics and demography of western lowland gorillas. The study monitors over 430 individual gorillas, as well as other species such as forest elephants, sitatungas, forest buffalo, and 46 unique plant species. Research helps to inform scientists on gorillas’ vulnerability to threats, helps them to predict their ability to recover from decline, and formulate effective conservation strategies. What is it like to be a tiger keeper?